Could it be that your infection-fighting white blood cells are responsible for triggering the development of new cancer cells? Researchers from McGill University in Montreal think so. According to the researchers, these white blood cells that normally protect the body from foreign invaders and pathogens may help cancer cells spread to secondary tumors. While this may seem like distressing news, it may result in something very positive in the world of cancer treatment: adapting existing medication used in the treatment of other diseases. These medicines could be harnessed to fight white blood cells that trigger metastasis. The only thing left to determine would be the dose needed to halt this process and the optimal time to take the medicine. When cancer has metastasized, tiny clumps of cells have transported themselves through blood or lymph to another site in the body. A new tumor begins growing at this new site and the cancer is said to have spread or invaded other parts of the body, separate from the original tumor. How did the researchers discover the link between white blood cells and metastasized cancer? They first noticed from previous research that cancer patients who experienced a severe infection after surgery had a much greater chance of the cancer returning in other places in the body. This led the researchers to investigate the process of infection and the cells that were heavily involved in the infection process. An obvious place to look was white blood cells. These cells are used by the body to fight infection and also play a role in inflammation and allergic reactions. White blood cells circulate in the blood so that they are ready to move quickly to an area where an infection erupts. The problem the researchers faced was tracking down which white blood cells might be implicated in cancer metastasis. 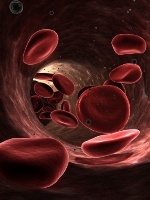 In a normal adult, there are upwards of 8,000 white blood cells per microliter of blood. These cells can be divided into six main groups: neutrophils, eosinophils, basophils, bands, monocytes, and lymphocytes. Neutrophils by far make up the largest portion of white blood cells at 58%. On a hunch, the researchers zeroed in on neutrophils. When neutrophils are being a force for good, they are one of your body’s main defenses against bacteria. They actually eat bacteria—a process called phagocytosis. Each neutrophil can phagocytize up to 20 bacteria before they die. What an ingenious system inside the body to deal with harmful bacteria! However, when it comes to cancer cells, neutrophils can trap not only bacteria, but cancer cells as well. Instead of killing off the bacteria and the cancer cells together, the researchers discovered that the neutrophils somehow activated the cancer cells. This activation makes them much more likely to develop more tumors in the body. Now, here’s where medication may be able to help. According to the research team, using medication to break down the trapping system of the neutrophils could significantly lower the risk for tumor growth and metastasis. At least, this is what the researchers found when they gave medication to mice who had cancer. We will have to stay tuned to this exciting discovery. This could be a very promising treatment to stop the spread of cancer cells and the grave risk that multiple tumors place on an individual’s health. Cools-Lartgue, J., et al., “Neutrophil extracellular traps (NETs) sequester circulating tumor cells and promote the development of metastasis,” J Clin Invest. Published online July 1, 2013. Bianco, C., “White Blood Cells,” HowStuffWorks web site; www.science.howstuffworks.com, last accessed July 7, 2013. “How the body aids and abets the spread of cancer,” McGill University Health Centre website, June 28, 2013; www.muhc.ca, last accessed July 7, 2013.